I wondered how difficult it is for a woman to be a surrogate mother irrespective of the objective. Writing few books have taught - true Devdas are authors. If authors' adopt similar concept of surrogacy than book can evolve. We have many examples to quote, Amitabh Bachchan, Shahrukh Khan and others that symbolise the surrogacy of continue doing movie irrespective of critics, and box office result. Authdas is Author das! Plot of Authdas character: I taught if Authdas (booklorn -book sick) as Devdas (lovelorn -love sick), whose love is write a novel, Paro. Authdas needs some inspiration to write Paro and if that inspiration was Chandramukhi, how the story would be? 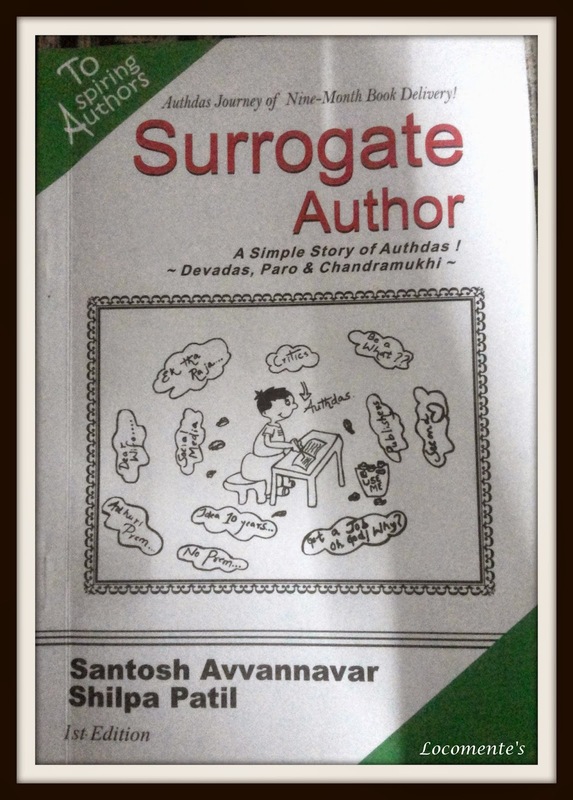 Story of Surrogate Author: Keeping the above plot, I looked into various movies - few movies that often people continue to enjoy are Devdas, Sholay and DDLJ. Keep those baseline into mind Surrogate Author book was written. The book is inline with Devdas. I assume that people, who love devdas would perhaps relate and link to Authdas. I thank Sanjay Leela Bhansali for giving an visually stunning movie, Devdas. What does this book provide? There are two sections: First section has the story of Authdas. It is a drama based on Bollywood movies Devdas, Mohabbatein, Sholay and DDLJ. Second section has some inputs to begin as a writer. The book is meant for aspiring authors, people who enjoy drama, movies and entertainment. What is the objective behind the writing? To encourage aspiring authors and continue to write because they love it. A part of fund will be given to educate a girl child. Santosh Avvannavar started his career as a consultant and Soft Skills Trainer. After his college education from NITK, Surathkal, he worked as a researcher at University of Eindhoven, University of Twente, and Indian Institute of Science, Bangalore. He was also the Placement President while working at IISC, Bangalore. He has over twenty-five publications of mostly research documents in national and international journals. He has also authored sixteen conference papers and regularly writes articles for a national and worldwide daily paper. He also works as an advisor for different organizations. He also dabbles in fiction writing and is the author of Adhuri Prem Kahaniya; Dear Wife, Your Husband is not a Superhero; Second Heart; Get a Job WITHOUT an Interview and Be a B.A. He likes to devote his personal time in writing for a blog, namely the Amrita Foundation for HRD (www.amritafoundation.wordpress.com). He has conducted seminars and training sessions for more than 35,000 people in India and abroad over the last seven years. Shilpa S Patil is a faculty at KSWU, Bijapur. She holds Master's degree in commerce from Karnataka State Women's University, Bijapur and Bachelor's degree in commerce from A.S.Patil college of commerce, Bijapur. The title is catchy and very different. The cover page will showcase the difficulties an aspiring author face and the book blurb will surely help you decide that you have to read the book! Authdas is an engineer by profession/familial force and an aspiring author by passion. His first book named Paro is untouched for ten years because he is sent abroad to pursue education. When he returns back, he decides to continue writing his first book/love – Paro. But, his family disapproves this. The rest of the story speaks about whether Authdas succeeds in publishing his first book, Paro. With as less as 50 pages, the book is surely a winner! It is written like a play; scene by scene. The book is an adaptation of Hindi movie Devdas and has done a pretty nice job. I loved the way the author has tweaked the dialogs to fit the given plot. And I am not going to reveal that! In short, the book insists aspiring authors to love their books only as much as a surrogate mother loves her child. Once the book is written and published, it is readers’ and reviewers’ responsibility to read/criticize and contribute towards its fame and growth. The author has to move on and concentrate on writing his next book. If you have enjoyed Shahrukh Khan-Aiswarya starrer Devdas directed by Sanjay Leela Bansali, you will surely enjoy this! Because I liked it for the precise reason! Thank you for the promising review! Appreciate your time and effort. Thanks for a wonderful book! The book seems quite different and interesting... It feels great to learn that a part of the earnings is utilised for a noble cause.